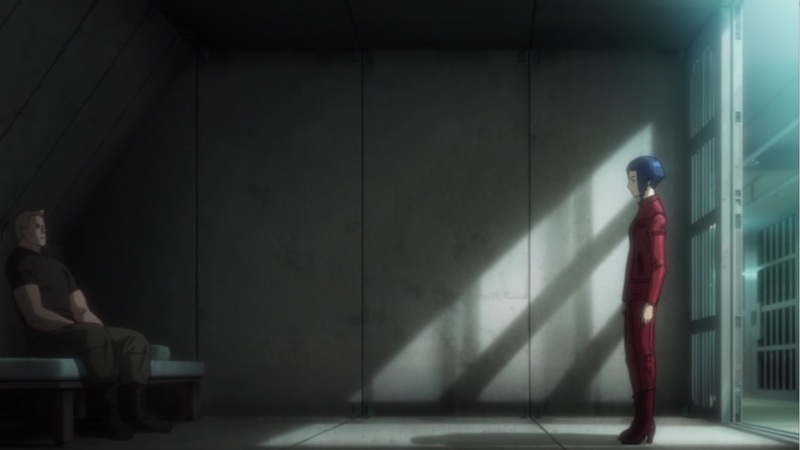 Like The New Movie, this series delves into Motoko Kusanagi’s past and how she joined Section 9. I feel like the series missed an opportunity in this department, though. It shows how she meets and allies with the main cast of the franchise, and I thought I was going to get a bigger focus on the minor members of the team. 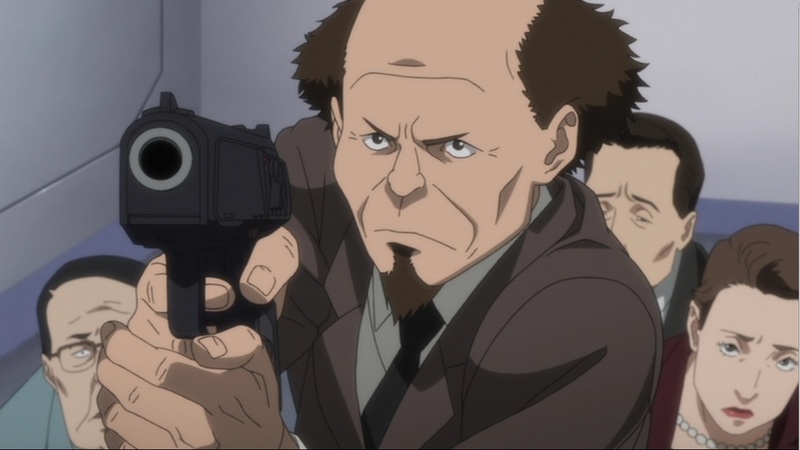 There’s a little bit of detail on the personalities and histories of Paz, Borma (or Boma, take your pick), Saito, and Ishikawa; but once introduced, they recede into the background once again, never growing beyond the same role of background assistant to the main characters that they’ve always had. I would have liked to see more from these characters and was disappointed that they were left behind. 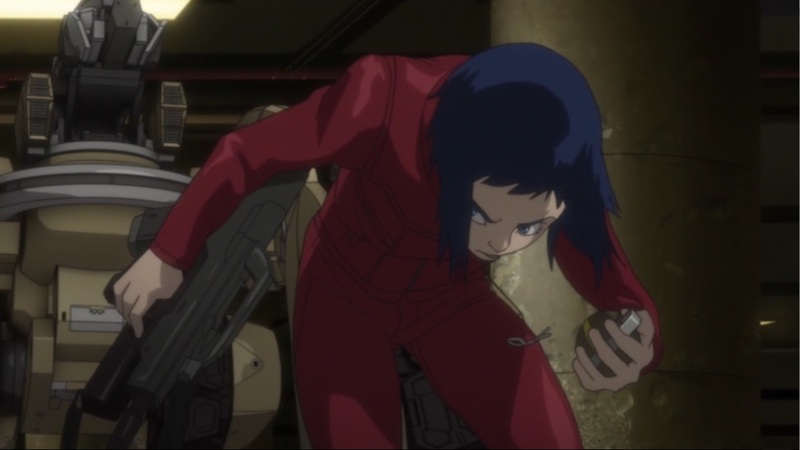 One of the most immediate changes from older entries in the franchise is Motoko’s costume for this series, which is now a vivid shade of red. She wears it constantly, even when it gets ripped up in combat. Next episode, though, it’s guaranteed to be fixed up and back in action. Even in the few moments where she does change her clothes, it’s usually to something else bright red (at least when she’s not just taking off her clothes). This color scheme is very different from what she has traditionally worn in the franchise and stands out strongly. Considering the production quality of the series, this has to have been a deliberate choice rather than a budget-saving shortcut, though I can’t figure out the purpose of it. So the thing has been rattling around in my mind as I tried to come up with an explanation, wasting energy that could have gone towards figuring out the plot. That plot is, of course, convoluted and intricate. As with The New Movie, I think I need to watch it again, in the proper order this time, in order to figure out just what was going on in this series. But while the series has information somewhat necessary to understand what’s going on in The New Movie, the story doesn’t feel very essential to it all. Each episode is its own mystery to solve and could probably stand on its own. And while each of those mysteries revolves around the Fire-Starter virus, none of the episodes really add anything new to solving that case. They all spiral out to a villain or victim that really doesn’t have much to do with tracking down and stopping the virus. I’m still on the fence on whether this makes the series futile and irrelevant or a justifiable and functional way to tell an episodic story, but I do think things would have been better if the series had a stronger focus on its central conflict. There’s still plenty of action in Arise, and this time it leans pretty heavily on ripping apart cyborgs limb from limb and showing off their broken mechanical insides. Apparently someone really liked the final action scene from the original film where Major Kusanagi rips her body apart trying to fight a tank. The action is pretty well done, but it mixes in a lot more on-the-fly hacking during the fights, and I’m not sure how I feel about that. It’s something that hasn’t been incorporated directly into the action scenes before, so it feels out of place with the established technology of the world. 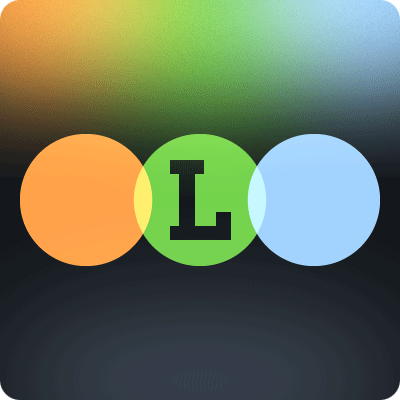 But innovation is an essential part of making new art, so I’m leaning towards it being a good thing overall. I’m still not too hot on the virtual reality hacking sequences, though. I guess you have to make your hacking scenes visually engaging somehow, so maybe I shouldn’t complain. A more personal oddity of this series is that this time I think of its main character by her given name “Motoko” rather than her family name. In every other version of Ghost in the Shell I have thought of her as “Major Kusanagi.” This change probably has to do with how distant she has been as a protagonist in the prior stories. It makes me think of her as a different person from the other stories. This is part of why I never really wanted to delve too much into Kusanagi’s past. No matter what kind of history they gave her, it would have felt “wrong” somehow. The Mamoru Oshii films, the Stand Alone Complex series, that old PlayStation game, and to an extent even the manga all have some degree of wholeness in my mind. A sense that they are all a part of the same world, even though I know they aren’t completely consistent with each other, or even trying to be. But Arise and The New Movie feel like a different version of the characters and their world. Maybe not to the degree that Adam West and Christian Bale are different versions of Batman, but for the first time I can’t reconcile this series with the previous versions. That’s not really a bad thing, but it is a bit jarring for me. Maybe it’s all just good practice for the live-action movie coming out which will certainly be another very different version of the character. So now we come to the sticky bit, which is trying to figure out whether or not I like the series. I’m afraid that like The New Movie, I’ll need to see it again to really know the answer to that. 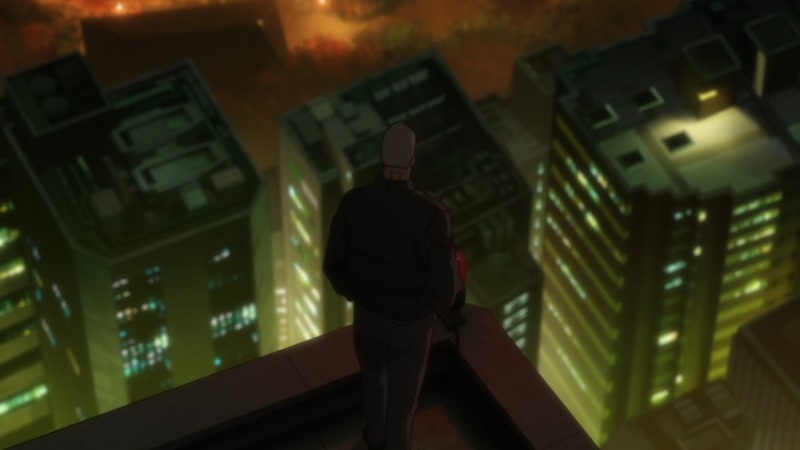 But despite that uncertainty, I would still recommend the series to any Ghost in the Shell fan who hasn’t seen it yet. 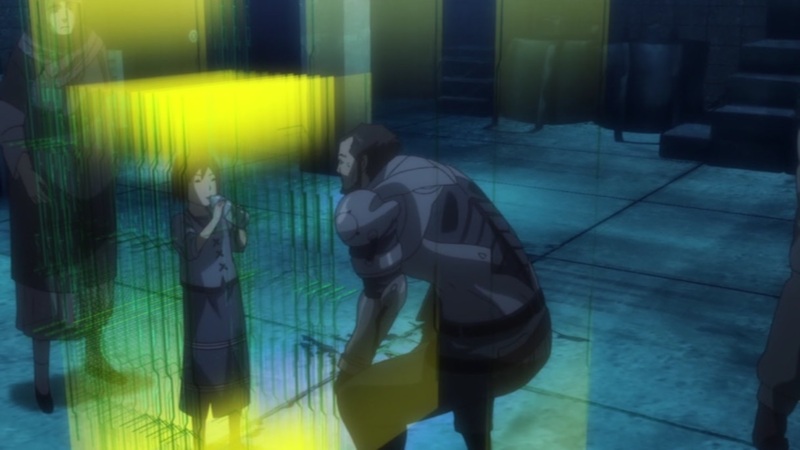 If the series wasn’t confusing it wouldn’t be a proper Ghost in the Shell story anyway. As it stands, Arise has enough going on to make you think, enough action to keep you entertained, high enough quality to its animation that it looks good, and a strong focus on the themes of how much freedom you can really have in a world where your mind and body can be easily tampered with and controlled by others. 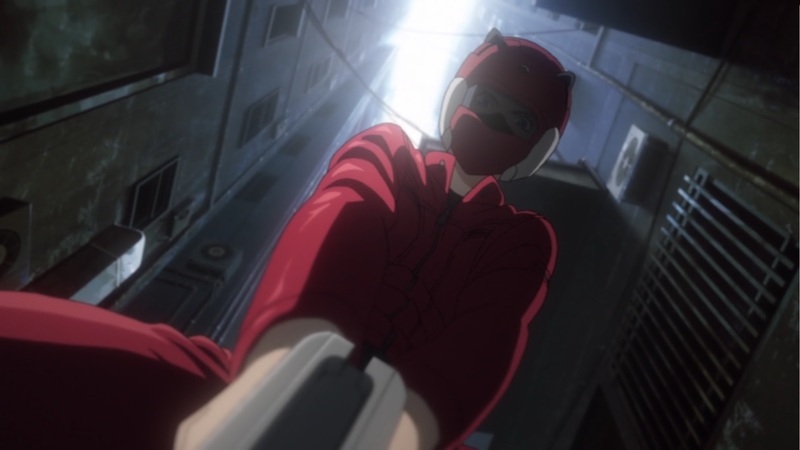 That’s what Ghost in the Shell has always been about, and Arise hits those selling points as hard as any other entry to the franchise, so it’s certainly worth a look.